Santa Clarita Christian School, Trinity Classical Academy and Albert Einstein Academy may be small, but this year’s success proves that they are mighty. SCCS made strides in football, earning its first-ever playoff spot in 11-man play. The team was led by Jacob Moss, who ended the season with 2,617 all-purpose yards. The girls soccer team continued on its path of dominance, going undefeated and snatching the Heritage League crown for the second consecutive year. The Cards were led by Chloe Edwards, who was named the league’s Player of the Year after scoring 23 goals and assisting on 11 others. Victoria Kirshner was as successful in the water as any on land, winning two CIF-SS Division 4 titles in the 50- and 100-yard freestyles, making for six titles in her four years at SCCS. 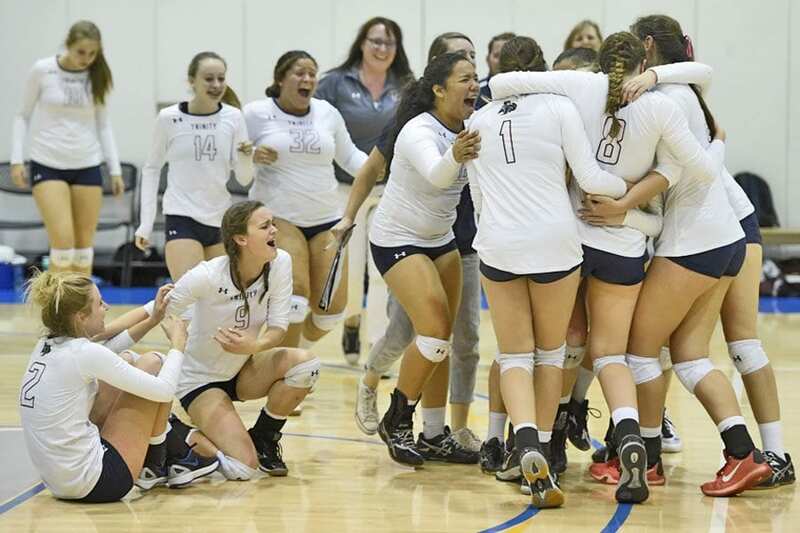 Trinity girls volleyball took down crosstown rival SCCS two times on its way to winning the Heritage League title for the first time in program history. Solomon Strader was the most successful track and field athlete in the Santa Clarita Valley, reaching the CIF state meet’s podium after finishing sixth in the 400-meter dash in his freshman year with the Knights. Trinity’s Dustin Kua made the longest postseason run of all SCV tennis players, advancing to the CIF-SS Round of 16. Sumner Howell, who competed in wrestling and baseball, was named the Knights’ Male Athlete of the Year, and cross country and track and field runner Elena Martinelli was named Female Athlete of the Year. Caden Kulp (football and basketball) and Emily Buchanan (volleyball and soccer) were named Male and Female Scholar Athletes. Einstein athletics also basked in success, particularly in baseball and girls basketball. Sam Stulman, the Omega League Player of the Year, led the Rockets baseball team to their second league title in a row with his power on the mound and at the plate. A playoff run that ended in the quarterfinals made for a historic girls basketball season. The team had never before been beyond the first round of a postseason tournament. Helen Rodriguez, who was named an Einstein co-Athlete of the Year, was a driving force in the playoff push. Chaz Carl, who played soccer and baseball in addition to competing with the track and field team, was the other co-Athlete of the Year. Sadie Sheridan was the Rockets’ scholar athlete. Santa Clarita International boys basketball can’t be forgotten, either. The team is paving the way for future Stallion success after making the CIF-SS Division 6 tournament. The accomplishments of these four schools show that from top to bottom, the SCV is filled to the brim with athletic talent. Einstein baseball They took the Omega League crown for the second year in a row and only had six losses on the entire season. SCCS football The Cards advanced to the 11-man football playoffs for the first time and made it to the quarterfinals in coach Garrick Moss’ final year with the team. Einstein girls basketball This was the most successful team in school history. The Rockets made it through the first round of playoffs for the first time ever and made it to the quarterfinals. SCCS girls soccer For the second consecutive year, SCCS was the undefeated league champion. It had four losses overall on the season. Trinity volleyball The Knights won the Heritage League title and beat SCCS for the first time in program history this season. Justin Collins As a sophomore on the SCCS basketball team, he averaged 17 points per game and was named to the All-Heritage League first team. Caden Kulp Trinity basketball, football and track and field are all on Kulp’s resume. In football, he rushed for 408 yards and had 267 receiving yards for a total of four touchdowns. Jacob Moss He played both basketball and football for SCCS, but he really shined in the latter with 1,601 receiving yards and 429 rushing yards for 20 total touchdowns. Moss also added 48 tackles and returned 26 punts for 1,158 yards. Solomon Strader Strader represented Trinity at the CIF State track and field meet, placing sixth in the 400-meter run. He also competed in the 200 and the 4×400 relay team. Sam Stulman The All-Omega League pitcher of the year allowed 14 hits and recorded 64 strikeouts in addition to having 28 hits and 17 RBIs for Einstein. Hailey Aguilar An All-Heritage League first-team pitcher, the Cardinals’ Aguilar fought through multiple ankle surgeries to record 51 strikeouts on the mound and earn a .553 batting average. 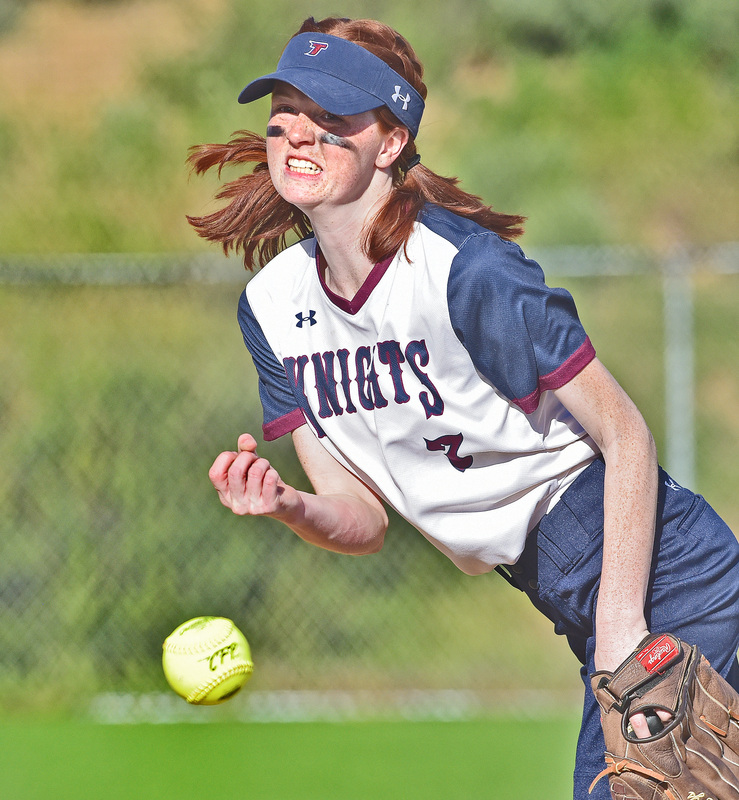 Jessica Eblin Eblin helped Trinity to its first league championship and was named the Heritage League MVP. She had 48 aces, 162 assists and 84 digs. Chloe Edwards SCCS’s Edwards was the Heritage League girls soccer Player of the Year and scored 23 goals on top of 11 assists. Victoria Kirshner The SCCS swimmer won the CIF-SS Division 4 titles in the 50- and 100-yard freestyles. She has six CIF-SS titles in four years. Helen Rodriguez She was All-CIF and All-Omega League in both basketball and volleyball for Einstein. Rodriguez used her height to score 13.1 points per game in basketball and accumulate 175 kills in volleyball. Playoff teams SCCS Baseball Moving up from Division 7 to Division 6 was tough. Although they were the second-place finisher in the Heritage League, the Cards lost in the first round to Pomona High. Boys basketball The Cards lost to No. 1-seeded Rolling Hills Prep of Los Angeles in the first round of the CIF-SS Division 5AA playoffs. Girls basketball Finishing the season second in the Heritage League, SCCS lost to Linfield Christian in the CIF-SS Division 6 quarterfinals. Football The Cardinals had only one league loss to finish second in the San Joaquin League. Their playoff run ended in the second round of the CIF-SS Division 13 quarterfinals. Girls soccer After its second undefeated league season in a row, SCCS advanced to the CIF-SS Division 6 playoffs before falling to Rialto in the first round. Softball SCCS couldn’t get past No. 1 seed Village Christian in the first round of the CIF-SS Division 7 playoffs. Girls volleyball The Cardinals had two five-game wins to start the postseason before a three-game loss to Capistrano Valley Christian in the CIF-SS Division 9 quarterfinals. Baseball The Knights went 5-5 in league before taking on Coast Union in the first round of the CIF-SS Division 7 tournament. Girls basketball Trinity coasted to the CIF-SS Division 5A quarterfinals before being stopped by Bellarmine-Jefferson of Burbank. Boys cross country A seventh-place finish in their heat earned the Knights a spot in the CIF-SS Division 5 finals. Golf The Knights made the cut for the CIF-SS Northern Division Team Championships. Boys soccer This team fought their way to a wildcard game, but fell to Foothill Tech under first-year head coach Greg Hayes. Girls volleyball After a year of unprecedented success and a Heritage League title, Trinity lost 3-2 to San Gabriel Academy in the Division 9 quarterfinals. Baseball The Rockets repeated at the Omega League champion and lost to Coast Union in the second round of the Division 7 playoffs. Girls basketball For the first time ever, Einstein advanced through the first round of playoffs before ending its season in the CIF-SS Division 6 quarterfinals. Boys soccer Einstein won its first ever Omega League title with an undefeated record. Its postseason run ended in the first round of the Division 7 playoffs. Girls soccer A narrow loss in the first round of the CIF-SS Division 7 playoffs closed out the Rockets’ season. Boys volleyball In the program’s first year, Einstein earned a wildcard game in the CIF-SS Division 5 tournament. Girls volleyball The Rockets extended its final match to five games before losing to San Jacinto Valley Academy in the CIF-SS Division 10 playoffs. Boys basketball The Stallions went 7-6 and made their way to the first round of the CIF-SS Division 6 tournament.